Take Current Affairs quiz March 16, 2019 to enhance your General Awareness. Practice with our esteemed Current Affairs quiz March 16, 2019 questions which covers all important events across India as well as World. Make use of all important Current Affairs quiz March 16, 2019 questions with answers updated here, at free of cost to succeed in all competitive Exams and Interviews. Who has been named to be India's first anti-corruption ombudsman, or Lokpal? Pinaki Chandra Ghose, is likely to be India’s first anti-corruption ombudsman, or Lokpal. Lingayat Pontiff Maate Mahadevi died aged at 74 years. Who won the Men's singles in the All England Open Badminton Championships 2019? All England Open Badminton Championships 2019 was held from 6 Mar 2019 to 10 Mar 2019 at Arena Birmingham, Birmingham, United Kingdom. The Winners in the various categories of the are: Men's Singles: Japan's Kento Momota. Which of the following water purifier brand receives the Best Domestic Water Purifier Award 2019? Kent RO Systems Pvt. Ltd. has been bestowed with the Best Domestic Water Purifier Award 2018-19 for its RO (Reverse Osmosis)+ UV + UF (Ultra Filtration) technology at the Water Digest Water Awards organized at The Lalit, New Delhi. Who is appointed as mediator to resolve disputes of cricket administration by SC? S. Narasimha is appointed as mediator to resolve disputes of cricket administration by SC. NGT has suspended the Environmental Clearance of August 1, 2017, granted for the expansion of the thermal plant of ________. NGT, New Delhi, has ordered the suspension of the Environmental Clearance of August 1, 2017, granted for the expansion of the thermal plant of Udupi Power Corporation Ltd. (UPCL) at Yellur in Udupi district. IIT Kharagpur has signed an MoU _________ to set up a 1.3 Petaflop high-performance computing facility. IIT Kharagpur has signed an MoU with Centre for Development of Advanced Computing (C-DAC) to set up a 1.3 Petaflop high-performance computing facility and data centre funded under the National Supercomputing Mission. Which of the following Institute has designed an app to detect Fake Currency? The Students from IIT- Kharagpur has devised a code for a Smartphone application to address the problem of detecting fake Indian currency. Detecting Fake Currency Students of IIT- Kharagpur has developed an image processing application which can detect counterfeit currency. The mission Smart India Hackathon 2019 is organised by __________. Smart India Hackathon 2019 organised by Ministry of Human Resource and Development in association with AICTE, i4c and Persistent Systems. Syed Mushtaq Ali Trophy is associated with which of the following game? The Syed Mushtaq Ali Trophy is a Twenty20 cricket domestic championship in India, organized by Board of Control for Cricket in India (BCCI), among the teams from Ranji Trophy. It is named after a famous Indian cricketer, Syed Mushtaq Ali. India got first TIR shipment via Chabahar Port from Afghanistan. What is the full form TIR? TIR is ‘Transports Internationaux Routiers’ which is a UN convention that allows goods to be sealed in compartments and requires no need for physical checking of the contents. This enables shipments to pass through countries without being opened at borders. Which of the following got Geographical Indication (GI) tag by the Geographical Indications Registry? Geographical Indication (GI) tag granted to Coorg Arabica Coffee and 4 other varieties of Coffee by the Geographical Indications Registry. Joint exercises to be conducted by US army and NSG in Hyderabad. Who inaugurated festival of Innovation and Entrepreneurship in Gandhinagar? President Ram Nath Kovind inaugurated festival of Innovation and Entrepreneurship in Gandhinagar. Which of the following sports person ranked No:1 in ‘ESPN World Fame 100 list 2019’? This year’s ESPN World Fame 100 list, an annual list of the most famous athletes on the planet, placed the Portuguese footballer Cristiano Ronaldo at the top spot, followed by former Basketball player Lebron James and FC Barcelona captain Lionel Messi. Who is the only Indian athlete in the top 10 rank of ESPN World Fame 100 list 2019? Indian skipper, Virat Kohli, stands on the seventh position and is the only Indian athlete in the top 10 club of this year’s ESPN World Fame 100 list, whereas Dhoni is placed on the 13th position. Which country will host the U-17 Women's World Cup in 2020? International Football Federation (FIFA) President Gianni Infantino announced that India will host the U-17 Women's World Cup in 2020. The tournament in India will be the seventh edition. Are you looking for right place to enhance your Knowledge on Current Affairs of 16th March 2019 through effective Quiz section? FreshersLive grants you the advantageous Current Affairs Quiz questions with accurate answers for 16th March 2019 which covers all the important events, supreme Awards, major occurrences in the National as well as World level. All important Current Affairs Quiz questions of 16th March 2019 are updated instantly in this page. Everyday at least 25+ Current Affairs Quiz Questions are displayed in this FreshersLive page. Correct Answer for each quiz question is given at the end of the entire 16th March 2019 Current Affairs Quiz questions section. You can estimate and upgrade your GK by attending these useful quiz questions. 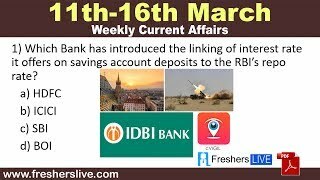 Entire quiz questions of 16th March 2019 Current Affairs covers Competitive Exam as well as Interview point of essentially important topics like International News, National News (ie. Indian Affairs), Science & Technology News, Environmental News, Bills & Acts Passed by Government, Defence News, About important Persons, Places, Banking & Economical News, Awards & Honours, Sports News, Revolutionary Updates on Arts & Culture, Obituary, Summits & Conference, Important Committee, Schemes, Appointments, Important Days & its Theme for Current as well as upcoming Year, Books & Its Authors, Agreements & MoUs, Budget, Taxes, Various Important Lists & Indexes, Visits by World Presidents, Prime Ministers, Political affairs and all Current Events. 16th March 2019 Current Affairs Quiz Questions updated in this page are prepared in the sense to help all aspirants to succeed in various Competitive Exams like UPSC IAS and other Civil Services Examination, Various Bank exams like IBPS PO, IBPS Clerk, SBI PO, SBI Clerk, RRB PO, RRB Assistant, Insurance exams like LIC AAO, UIIC Assistant, Railway Exams, Various Central Government Exams like SSC CGL, SSC CHSL, and more. Attempt all the Current Affairs Quiz Questions of 16th March 2019 and evaluate your score by matching your response with the correct answers mentioned at the end of this quiz questions section. By practising the FreshersLive Current Affairs Quiz Questions on a daily basis, you can surely succeed in the competitive exams as well as the interviews easily. Make use of this ultimate resource to the fullest and quickly achieve your goal!